The chill of an autumn morning holds the city in its thrall. Dead leaves drift from the sleeping trees to carpet the pavements in crisp fragments of bronze and gold. The sun burns cold in a piercing blue sky. Offices and shops bulge with scarf-clad workers, warming their shivering hands on steaming mugs of tea. They fight for space around small stoves and fireplaces. Hope Lane curves through the overcrowded alleys near the workhouse. Footsteps ring out on the cobbles as a stream of notes curls down the narrow street. The blacksmith's apprentice presses his face against a grimy window. He forgets the dull ache in his arm, and runs outside. The old and infirm shuffle to the doorsteps of their tiny homes. Gaunt women carry skinny babies. The accordion's picture of the impending season muffles their sadness. The old man limps down the street, swathed in a cheerful red coat and hat. His deft fingers manipulate the keys, oblivious to the frosty air. The scent of cinnamon and roast chestnuts wafts in his wake; the apprentice dreams of candy canes and sugar plums. He pauses outside the forge. The new song begins and he plays with gusto, conjuring the spirit of King Wenceslas. The babies gurgle and the apprentice sways to the music. Fingers fumble in moth-eaten pockets for their last few coins. They flash in the air, and a black monkey in a scarlet waistcoat collects them with nimble paws. Money buys happiness when the music man comes by. 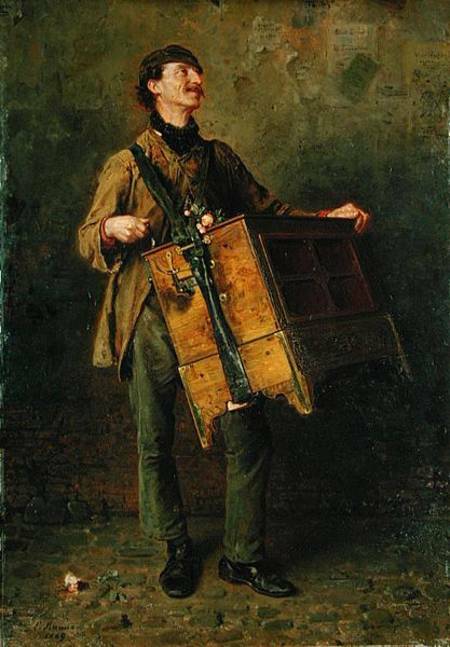 The image for this piece is Ludwig Knaus' painting, The Hurdy Gurdy Man (1869). You can buy a print here. I submitted the original version of this story to the 50 Stories for Pakistan project, but it wasn't selected. Carrie Clevenger acted as a valued beta reader as I knocked the story into the shape you see now. 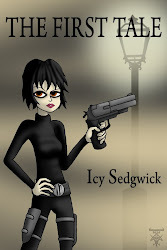 Icy, this is so damn well-written and rich with detail, I pictured it immediately. Just a great piece of work. You hooked right into it with beginning and the monkey was a nice touch. Great description, great details, great pacing. Perfect writing, Icy. I read it twice. Evocative of the holiday season and the Christmas classics we know and love. Excellent stuff! This is one of my favourite Icy-flashes. Simple and eloquent. And chock-full of awesome descriptive prose. Simple, concise and eloquent, I should say. A little snippet of sublimity. I can picture every detail, down to the chill of the cobblestones. Terrific. Wow, that picture takes me back. I thought I made up the "Hurdy Gurdy Man" when I was a kid, could never find proof the thing existed outside of my babbling. I should have just said organ-grinder. You make his existence sound so grimy. I guess it would be if you had to live with a monkey. Excellent details in this. John had it right. Grimy was the first thing that came to my mind. Good story! I feel frozen just reading this. 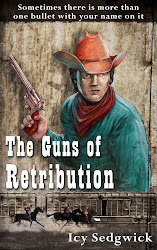 An excellent story packing with lovely little details, you captured the squalor and desperation of the season perfectly. Loved it! Julio - Thank you! I vaguely recall reading a story about a hurdy gurdy man when I was little and I loved the idea of it. Genevieve - I seem to be doing a lot of Christmas stories at the moment! Carrie - Thank you for all your help! I added a link to your website since you did beta read it for me several times. Chloe - Words are my paint, and all that. John - Yes! He is/was real! I think he's like the precursor to the excitement kids feel when they hear an ice cream van go past. Sam - Squalid, but they're still happy, and possessed by community spirit. You just don't get that now. Lovely descriptions. I could picture the scene perfectly. Well done! Wonderful Icy... THIS is now my personal favorite of yours. Wow. http://tinyurl.com/jimbronyaur-theburiedhouse <-- my #fridayflash this week! You packed a great little journey into such a small piece of writing. I was on that lane. I now fancy roast chestnuts - even though, back here,in reality, I find them just a little bit ick (which is highly disappointing). So a coin for the music man - and I'm surprised things didn't go more favourably in the competition. Maria - Thank you! I can't work out if I was going for happy or sombre with this one. Laurita - I seem to have gone all Dickensian of late! Stephen - It did take a different form when I originally submitted it. It was shorter, for one thing. I'm very proud of this version though. Stunning writing as always, Icy. The scene is so clear and real. I was right there with those poor people on Hope Lane, which is a great name for this street. You're stories are always so descriptive, I can see and hear and feel every moment. A beautiufl Christmas tale. Very eloquent Icy, in a harsh life small pleasures mean so much. Cathy - I LOVE the smell of cinnamon. It IS Christmas, as far as I'm concerned! Danni - I see all this in my head before I write it down. Some people would call that craziness, writers call it imagination! Steve - Sometimes it's the little things that make all the difference. You pack so many lovely details in this. Nice one. Lovely, lovely story. The chill may be in the air but this story warms the bones. Ah, the magic of music. It can so often make us forget "the real world". I love the imagery here, especially that of the monkey collecting coins. I really love this. You've captured a truly magic moment. Thanks for bring us there! That was tremendously descriptive writing, Icy. A fantastic merging of sights, smells and sounds. Well done. With such vivid descriptions, it's easy to see the world you've painted here. Well done. I especially like this: "The sun burns cold in a piercing blue sky." Sometimes, it's just that cold, isn't it. I love the details you capture in this piece. I like the way he muffles the sadness. This piece reminded me of your previous piece of Melancholy; but more in style and this being a counterpoint to it. Tim - Thank you! I've come to discover flashes are what I do best - I just can't sustain that for a novel. Deanna - I saw a painting of a hurdy gurdy man with a monkey (not the one here) when I was little and it's always stayed with me. Alan - I love putting smell in my writing. Probably because I'm a bit short-sighted and my nose is more reliable! Stephen - Yeah, it's a weird sensation when the sun is shining but it's freezing, isn't it? Glad I managed to communicate that! Aidan - Funny you should say that! It could almost be the same street...though I guess the Music Man takes the role of Joy. A much more welcome visitor! Beautifully written, thoroughly enjoyed that, Icy. I love that you included all the senses in this story. You not only created the man from the painting, but every aspect of the world he's in, down to the scents wafting in the air. Lovely. So much soul to this. Concise and beautifully executed. I really enjoyed it. Thanks! The detail drives this piece so well. Just the right amount of words in the perfect place is superb. I love your world here, it's a simpler, more innocent place where small things make people happy, if only for a fleeting moment. What a treat from you Icy. very precise writing, Charles Dickens comes to my mind. the point of the story speaks for itself through the details given. The detail is so vivid and rich. I feel like I am there waiting for the music man.